Note from shop owner Due to some recent life changing events, we are taking a short break. Once things are back in order, we will reopen! Stay tuned! Due to some recent life changing events, we are taking a short break. Once things are back in order, we will reopen! Stay tuned! Very pleasant to deal with. Responded to my messages quickly and made sure my order was what I wanted! Will do business again! Love this pacifier clip! I also have a teether from this shop and love it as well. My baby loves chewing on these way more than any other teething product from the store. The only thing I would recommend is remembering to specify the color of clip you want. It says they will match it to the colors you chose for the silicone beads, but I feel like mine doesn't match well. Not a big deal, otherwise great! Get your Black Friday shopping done early! Sale runs through Monday. 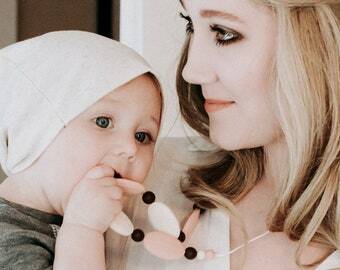 Now through Saturday, all teething necklaces are 20% off! I am a wife, a "mama", certified veterinary technician, crafter, breastfeeder and babywearer. I've always had a love for making things with my hands. When I was a child and my friends were playing with dolls or other toys, I was painting, crocheting and even making tissue paper clothes for the few dolls that I did own. When my daughter was about 5 months old, she became obsessed with my necklace, and I was concerned that she would break it. So, I decided to make something that could withstand superbaby strength. Seriously, how can something so tiny be so strong?! I began searching for the safest supplies on the market. Nothing is more important to me than keeping our children safe. After extensive research, I chose a supplier and then all I needed was a name! Who is Millie Beth, you ask? The name Millie Beth was derived from my daughter's name. Amelia Elizabeth. Amelia is our Quality Control Expert! When I first started this business in July of 2016, I was looking for a way to enjoy my love of crafting, while being able to spend precious time with my daughter. With hard work and dedication, I was able to go from being a full-time Vet Tech to a part-time Vet Tech in May of 2018. I couldn’t have gotten to where I am today without my amazing customers, reps, enthusiasts and fans. Please know that my family and I are so very grateful for you love and support. Creators of the silicone mold that I custom designed. The final product is printed using sublimation at an outside print shop using our handmade designs. 1.) Providing and improving my services. I use your information to provide the services you requested and in my legitimate interest to improve my services. 4.) Protect the rights, property, and safety of my customers, or others. 2.) Receiving marketing messages from me after providing your express consent to receive them. In such cases, I will delete your personal information unless I have compelling and legitimate grounds to continue using that information or if it is needed for legal reasons. 3.) Complain. If you reside in the EU and wish to raise a concern about my use of your information (and without prejudice to any other rights you may have), you have the right to do so with your local data protection authority. For purposes of EU data protection law, I, Amber Sanna, am the data controller of your personal information. If you have any questions or concerns, you may contact me at hello@milliebethdesigns.com. •Given the nature of our products, they will wear out eventually, as any teething product will. It is up to you, as the consumer, to help prolong the life of your products once they are in your care. Wooden products should be refinished as needed with our All Balm. Silicone jewelry should be cleaned and allowed to dry completely as needed. •SILICONE PRODUCTS are top rack dishwasher safe! Yes, even the silk cord! Or, you can wash with a mild soap and warm water. Lay flat to dry completely before the next use. •WOOD, CROCHET & MACRAME PRODUCTS should be hand-washed only with a mild soap and warm water. NEVER allow your wooden or crochet beads to SOAK. Lay flat to dry completely before the next use. Refinish once dry. Are your Silicone products BPA Free? Wooden products Chemical Free? ‣All silicone beads/pendants and cord are FDA Approved, BPA/Phthalate, Lead, PVC and Cadmium FREE. ‣Safety certificates are available upon request. Why would I want a Wooden Teether? 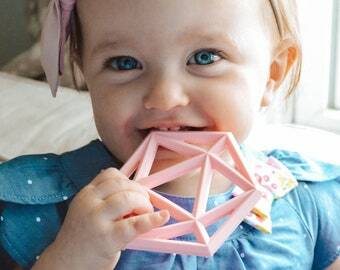 Wooden teethers are the most natural and eco-friendly teething products on the market. Wood is a regenerative and recyclable product that is naturally antimicrobial. All of our wooden products are crafted from specific tree varieties that are known to hold up well to gnawing with proper care. Due to variations in computer monitor settings, colors may be slightly different than what appears on the screen. Why are there dark specks in my All Balm? Our All Balm is made of natural, unrefined ingredients. Sometimes these ingredients may have sediment such as coconut husk and/or fibers, shea nut shell or bee propolis and/or honey. These bits of sediment are purely natural and do not affect the quality of your balm. Don't see what you are looking for? Send us a message and we'll be happy to do our best to make it happen. All items in our shop are completely customizable! Feel free to leave your requests (color, necklace length, etc.) in the note to seller at checkout. Or, you may send us a message before you place your order. Can your teethers be frozen? All silicone teethers can be placed in the freezer. Please do not freeze any wooden or crocheted wooden products as this can cause the wood to crack.